Chrysler may have repossessed his Chrysler 300C company car, but Lee Iacocca found a better car he wants you to buy. This custom fastback Lee Iacocca Limited Edition Mustang celebrates 45 years of the multi-special-edition car Iacocca helped create. The Iacocca Mustang is, fittingly, a 2009½ model year— a throw back to the original 1964½ 'Stang. Only 45 of these Mustangs will be built and sold of a cost between $60,000 and $65,000. What do you get for the change, other than an oddly-named special edition? LOS ANGELES (June 22, 2009) – Forty-five years after he introduced the original Ford Mustang, launched at a dramatic press conference at the 1964 New York World's Fair, auto industry visionary Lee Iacocca today announced a new version of the famous muscle car – the Iacocca Silver 45th Anniversary Edition Ford Mustang – a breathtaking vehicle that utilizes the latest in Ford performance technology with a style and panache that screams, Mustang fastback. 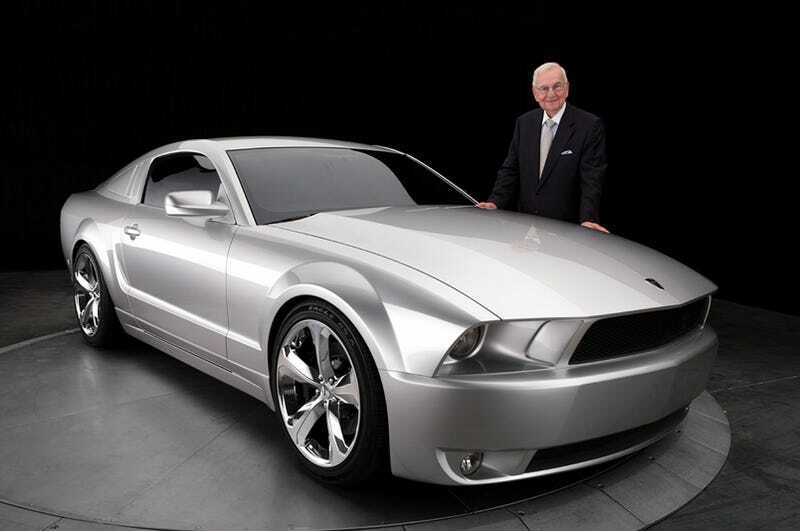 Only 45 "2009½" Iacocca Silver Edition Mustangs – all painted a special "Iacocca" chosen silver hue – will be built. Nearly two years in the making, the Iacocca Silver Edition Mustang is a collaborative effort by Iacocca, designer Michael Leone, and Gaffoglio Family Metalcrafters, the world-class coachbuilding and Design Company in Fountain Valley, Calif. The new business venture is called I Legacy, and it will be in concert with Galpin Ford, the exclusive Ford dealership to offer these Iacocca Silver 45th Anniversary Edition Ford Mustangs to the public. In a word, the new Iacocca Silver Edition Mustang is stunning. The lines flow organically from front to rear. The hand-crafted piece of rolling art, with its innovations and impact of the fastback design is truly exceptional in every way. With its sunken headlights, slanted grill and low stance, the car gives you "street attitude." "Once in a while a car comes along that changes everything, and that was the original Mustang," said Iacocca. The Silver Edition Mustang perpetuates the Iacocca mystique. The car begins life on a 2009 Mustang platform, which is then uniquely modified and coachbuilt. While the exterior fastback design of the Iacocca Silver Mustang is compelling, the mechanical underpinnings are true American muscle. Two power plant options will be offered, a normally-aspirated 4.6-liter Ford V8 rated at 320 horsepower and an optional supercharged version that delivers a head-snapping 400‑horsepower. Both engines are covered by a factory Ford warranty. Drivers will harness the power through a quick-shifting 5-speed manual transmission. The car's suspension has been upgraded to keep pace with the power delivery. A Ford Racing Handling Package adds firmer springs and re-valved shock absorbers. A 14-inch Ford Racing Braking Package is optional. All suspension components will be covered under a factory Ford warranty, as well. Inside the Iacocca Silver Mustang, the interior is resplendent with luxurious touches that highlight the car's special heritage, including Iacocca Diamond Design leather seats with embroidery stitching, an Iacocca signature dash plaque with serial number, a leather-wrapped steering wheel with "I" badge, and Iacocca-badged aluminum door sill plates. The cars will initially be revealed and then available at a reception in late July, at Southern California's Galpin Ford dealership, the world's largest volume Ford dealer for 19 years, as well as an innovator in the promotion and retail of specialty automobiles. The price is yet to be announced. The "Father of the Mustang" returns to the legend that started it all. For more photos, videos and/or information about the Iacocca Silver 45th Anniversary Edition Mustang and I Legacy, please log onto www.ilegacy.com. For sales inquiries please call Galpin Ford's Iacocca Mustang specialist, Brandon Boeckmann at 1-800-829-0744.